A lot of people have inspired me to really go for these goals this year. My Mum really got me into biking, I guess you could say I caught it off her. She's been a great support and we've had some really great (and some really not very great at all) rides together. My best friend and her partner have achieved amazing goals in the last year and after talking to her about how she's done it I know that I can too. My brilliant and supportive husband who is the strongest person I know has shown me that with determination you can overcome anything and achieve whatever you put your mind to. Seeing how friends have progress with their biking, meeting other women like me who love riding. 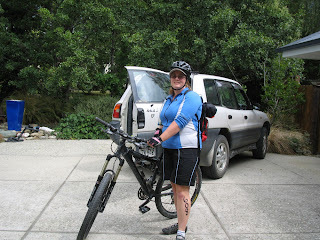 But I think the biggest inspiration now is the amazing community of cyclists, particularly mountain bikers, we have in NZ. So now I've the made commitment, here's the starting point. I'm 33, I currently weigh 81kgs (the horror, the horror) and I'm fairly fit. I've stuck a "before" picture up to remind me why I'm doing this. I've got a rough training schedule (today was a rest day) and I'm off to join a gym tomorrow. Eeeergggh, I've never liked gyms but I need to do weight training according to my doctor. Plus it would be really nice to be able to lift my bike over fences and gates without needing someone to come to my rescue. I've started adjusting my diet (no carbs in the evening now), which according to my nutritionist was already very good. Tommorrow I'm going up Kennedy's Bush, up Marley's Hill, down the Flying Nun, down Old Dyers Pass road and then home the back way (around 28kms with about 500m of climb I think). The single track makes the horrid climbing worth it.